The morning of day two started with a gray sky but the air and water was calm. The space inside my head was empty but filling rapidly with the various sensory triggers that are now very familiar to me in this wilderness. My brother already had the fire going again and before long we had a hearty breakfast of bacon and eggs ready. We had managed to carry in eight eggs safely the first day and I always insist on Maple Leaf Ready Bacon. It is precooked and lightweight, two ideal traits for backpacking food. After breakfast I go through my regular routine as I break camp and repack my backpack. First my sleeping bag and bedroll go in. Then my clothes, packed into a couple of large zip-lock bags, followed by whatever fits best until it is all in there. Last is my tent which I attach to the side of my pack, tent on one side, poles on the other. It works well for me. My stove and water filter, along with my snacks, camera, and journal go into the top bag to round out my gear. Like when I leave Long Beach Creek, the hike out of Seeley also brings sorrow. I often fear that I may never get back there before it loses its wilderness appeal to the planned development of the Fundy Trail Parkway. Alas, I have my own reality and non-wilderness issues that I need to deal with. So, for the sake of keeping somewhat of a schedule, we all head up and out of Seeley Beach. 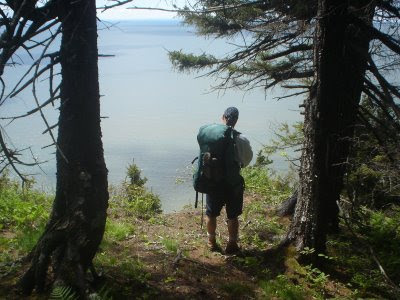 We amble towards what, I think, is the toughest part of the Fundy Footpath hike. The steep climb out of Seeley Beach takes you from sea level to an elevation of slightly over 200m. The first part of the climb is through lush softwoods, mainly spruce and fir, of various ages. The next stage is a small walk along an ATV trail, (not my cup of tea) before turning back towards the cliffs overlooking the Bay. For a short time here the walk is level and you are granted many great views of the Bay. On a clear day you can easily make out the shores of Nova Scotia and Iles d’Haut. The climb then gets very steep again as you scramble up around exposed rock faces that seem haunting. This eventually brings you to the south ridge of Cradle Brook, which is now 200m+ below you to the northeast. Now some people think that walking uphill is tough, but for some downhill is just as hard, especially if it is steep enough to make even an able foot mountain goat wary. The descent into Cradle Brook, while maybe not really tough for a mountain goat, is no walk in the park. You will cling tight to some smaller rock faces and zigzag down into the Valley. Suddenly, you enter an old meadow where, no matter the weather, the temperature always seems a degree or two warmer. The walk then levels off for a time before the final steep drop into Cradle Brook. In approximately 4km you hike from sea level to 200m and then back again, none of it easy. Needless to say we take a well deserved break at Cradle Brook. The sun is shining and our stomachs are hollering for sustenance. It is amazing what the human body will endure and how quickly it can recover. Backpacking has taught me this time and time again. In a short time we humped up out of Cradle Brook and because of the intense hike earlier we made light work of this steep climb. We were now heading to Little Salmon River and I had it in my head to take an alternate route to get there. As the group approached the McCumber Brook access trail we halted to consider our options. I really wanted to see the Walton Glenn Canyon. 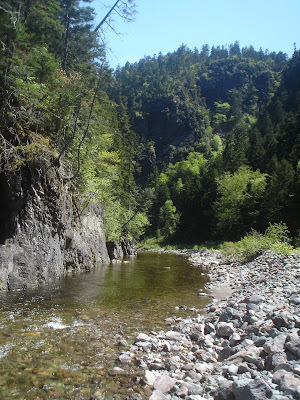 I thought, to save time, we could hike the access trail to the road; follow it to the Walton Glenn Canyon Trail; hike that to Little Salmon River; and follow the river to the campsite for that night. The group although hesitant, seemed agreeable to that plan. As we left the FFP though, I had a line from one of my son’s newest cartoon favorites ringing in my head. “Oh oh Zigby, I think your trotting us into trouble.” I shrugged it off though and headed down this new route. The new route would take us into Walton Glenn Canyon, where waterfalls and massive rock faces were the norm. We first had to get there though. I had never done this portion of the hike with a pack on before and I was in for a reality check. Typically, I accessed this area by coming up Little Salmon River to the confluence of Walton Glenn Brook and then hiking through the “Eye of the Needle” up to the Walton Glenn amphitheater and onto the top of the valley. Usually, when done that way, you get wet numerous times, so I often wear sandals to hike in. I equated therefore, that I could hike down with a full pack with little trouble. Boy was I wrong. We move slowly down the canyon taking in the vastness of this small piece of nature, but more slowly due to the difficult terrain. 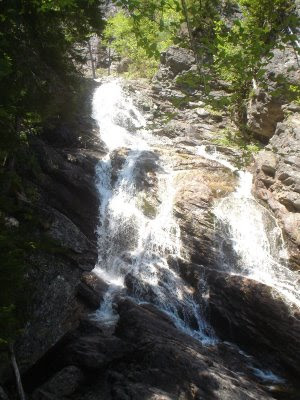 We enter the Walton Glenn amphitheater where Walton Glenn Falls drops close to 100m on your right while on your left McCumber Brook cascades steeply into a pool where the two brooks join. All around there are shear conglomerate rock faces reaching 100m towards the clouds and in places it seems as if it wants to fall in on you and keep you there. 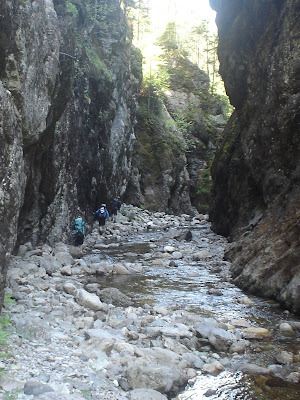 Further down the Walton Glenn Brook you enter a narrow canyon known locally as “The Eye of the Needle.” The entire bottom of the canyon is wet with the brook and is only about 10m wide at its widest point. The walls of the canyon reach heights of around 35m and the sun rarely reaches the canyon floor. None too soon, we reach our campsite. Everyone has their aches and pains and we all flop on the ground with a sigh. Again though, our bodies show resilience as we all get foolish and take a swim in the deep pool close to our campsites. Laughter erupts as we realize how foolish we are but we are all feeling very much alive and the aches and pains for the time being have disappeared. We laugh as we put up our tents and cook supper. That night the campfire was oddly quiet with little conversation. Our tired bodies and minds were still trying to comprehend the raw beauty of the natural surroundings we witnessed today. There was no need to talk and we had no energy to do so anyway. It was fitting that the day would end with a wonderful moon reflecting off the water in the estuary as the tide moved in. Mornings on the FFP are an exercise in determination. To backpack the Footpath you can usually count on having a steep hill to climb first thing in the morning. The toughest of those is the hill you face when you leave Little Salmon River heading to Rapidy Brook. There are quite possibly as many switchbacks on this one hill, than one you might face on any other complete day. You can continually greet your companions as they pass on the switchback below or above you as you all move along like a train moving up a mountain side. The entire portion we planned to hike that morning is likely the longest, gruelling, section of the trail. That morning we climbed in and out of 4 steep stream valleys. 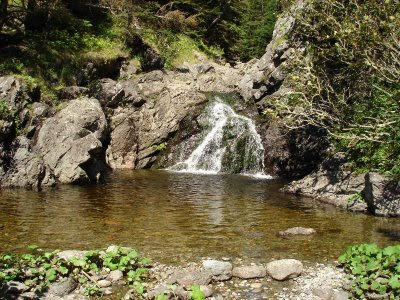 Rapidy Brook is a small stream where you cross above a narrow waterfall and gorge approximately 100m above sea level. You enter Wolfe Brook where a small waterfall enters the valley, and then you walk by the old dam site, before walking out to the shoreline. Hunter Brook is a small stream with big boulders that are carpeted with lush green moss. 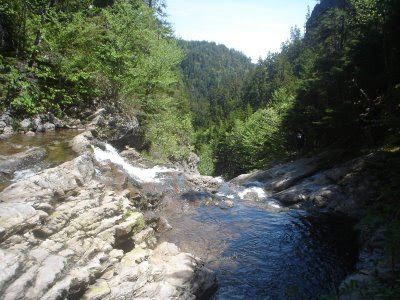 The last plunge is into Telegraph Brook where a waterfall crashes down less than 50meters from where the waves crash onto the shore. 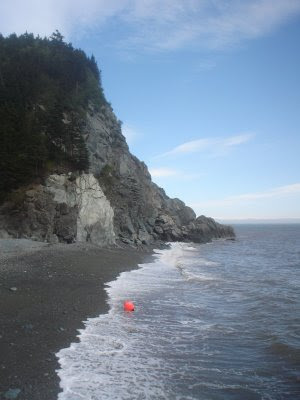 Even though this is a tough section of trail it hardly registers with the body because the mind is overwhelmed with the beauty and immensity of the Fundy coast. From Telegraph Brook the Footpath heads up hill towards a crossing of Quiddy River. When the tide is right though, you can choose to walk the beach from Telegraph Brook to Martin Head. Since we had hiked hard the day before, and that morning, we decided we would wait on the tide awhile and walk the beach not just to Martin Head but all the way to Goose Creek. The best thing about that choice was that we were able to goof around and relax on the cobble shore of Telegraph Brook. We threw a lot of stones at various targets; we climbed various rock faces and boulders; we argued about landforms and geology; and we kicked around a stray buoy we nicknamed Herman. Eventually, the tide receded far enough that we could comfortably hike along the shore to Martin Head. We ambled along the shoreline as the sun shone bright and warm on our right shoulder. The geology changes, and a small outcrop of beige sandstone, seemed out of place. The rocks and boulders rolled and clacked under our feet as we made the climb up over the isthmus. From the bottom of the isthmus I can’t see the Quiddy River and it is a short, steep climb up the rocky shore where you take two steps forward and one step back. The Quiddy River is a swift, cold, running river with a mud and gravel bottom. The beach on the other side of the river is a long, wide, sandy expanse used by many outdoor enthusiasts with various interests. On most weekends there are lots of people running bikes or trucks up and down the beach but on this weekend there are only a couple of trucks and bikes on the beach. We give them their space and they respect ours, not because we don’t like one another, but simply because we don’t want to intrude on each others wilderness escape. 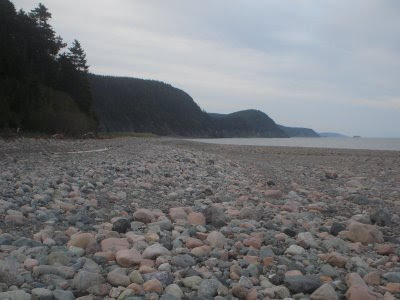 We reached the far end of the Martin Head Beach and here we had to rock hop and scramble over large boulders in order to make Goose Creek campsite. I always enjoy this part of the hike even though it is very risky. One wrong step could leave you with a concussion, a broken leg, or even worse. The rocks are often times wet and slippery so caution, patience, and awareness are needed. We make Brandi Brook in good time and I take a minute to take a picture of the waterfall that comes down right onto the crashing waves at high tide. Then we make the long beach of Goose Greek where we will camp that night. The beach leads up to the boulders above tide and we have fun playing in the sand as we sink a couple of inches with each step. The start of our last day on the trail required that we walk across the expansive mud flats of the Goose Creek estuary. This is a sticky, muddy, wet, and often cold crossing. The best time to cross Goose Creek is at near low tide as this will allow you to stay somewhat drier. If the tide is higher you must hike upstream and cross near the head of tide. This adds approximately a full kilometer to your hike. We were fortunate that morning as the tide was just starting back in. This was great here, but later, at Goose River, we were required to make a difficult bushwhack over two steep, large hills, as the tide was not in our favor there. Once across the mudflats we climbed up the south facing ridge of Goose Creek. This area was boggy in places but the forest was interesting with large moss beds, colorful flowers, and large forest meadows that provided great lookouts to the Bay. The weather was warm and sunny so the hike was enjoyable. We relaxed a bit at Jim Brook, where if you needed to you could pitch a tent and have a nice inland camp site. From Jim Brook the next river valley was Rose Brook. At Rose Brook we again took a breather and explored the beach a bit before heading on. The topography north of Rose Brook is impressive as there are many sink holes and rock outcrops to explore although we had to be careful as some of the holes could have been unstable. We walked along forested meadows and near Edwin’s Peak where we were offered a great view back down the Fundy Coast to Martin Head and beyond. It was hard to believe as we looked back over the land that we had hiked that in simply four days we had come so far. The last climb before we entered Fundy National Park was the climb into Goose River. It is a modest descent where you tend to follow an old cart road. The road symbolizes the history of the area and its connection to logging and maybe even farming. Our legs were well stretched now and our pace had become faster and we made good time getting to Goose River. Unfortunately because of the timing of the tide there was no way we would have made the hike in sufficient time to allow us to walk the mudflats here into the park. Instead we crossed the river above the dam and hiked up and over a steep but short hill into Rossiter Brook. 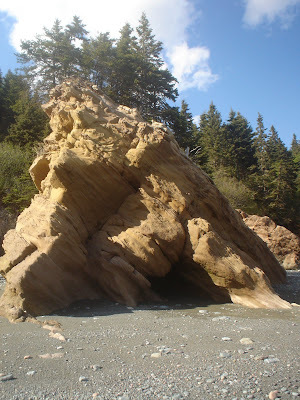 This still left us on the Goose River estuary with no way to cross to the trail and so again we had to navigate up a steeper more challenging hill to meet the Goose River Trail of Fundy National Park. I used the GPS I was carrying and made both bushwhacks with little trouble, well except for the fact we had to make very difficult climbs out of each valley. Our last meal of the trip was had sitting on the wood pile chatting to some Park staff who, had come to check the sites after the weekend. Once lunch was completed we started the last 7.5km hike out to the parking lot at Pointe Wolfe. I always find this old road walk a bit anti-climactic for such a wonderful hike. It seems that I always rush through this portion of the trail as there is little to see and this time was no different. It is funny though, as much as I consider myself an avid outdoorsmen who could likely survive for weeks alone in the wilderness, I always smile when I see the parking lot, It could be the thought of the famous sticky buns in Alma, or a tall ice cream cone, but whatever it is I always giggle when I reach the curbed, paved, non-wilderness area. It is ironic and sometimes I feel guilty about this appreciation of the man made comforts that are so intrusive to the wilderness I often try to seek out. We were able to spend four days in relative wilderness but each of us is concerned that it maybe the last time we can complete that hike and attain that feeling. 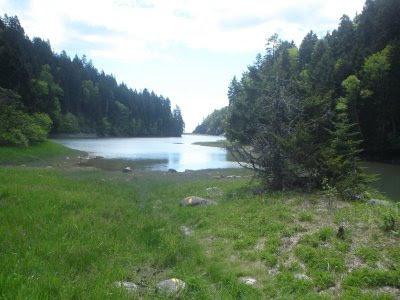 The Fundy Trail Parkway, forestry practices, and increased development of ATV trails will likely change this wonderful coast line and remove that surreal sense of wilderness. Regardless, the immense beauty, ruggedness, and the heavenly feeling I get when there, will call me back many more times I am sure and I hope to someday share a backpacking trip with my kids across this great coast line. Hey Ben, this is a great descrption and narrative of the FFP experience. I've hiked and photographed sections of this amazing wilderness, but not in it's entire span. 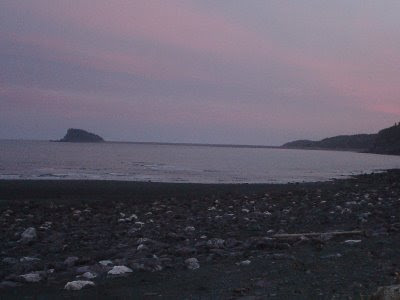 In fact were heading into Martin Head in the morning for an overnighter...hopefully I'll get a spectacular sunrise! Hey thanks for checking into my blog. Have a great trip into Martin Head and enjoy the sunrise. Thanks for you're detailed trip report. I just gleaned through it for details that will help me when I hike it next week. It's an incredible piece of wilderness but I'm too concerned about the pressures of monoculture forestry and car-centered tourism. Regardless though, I'm going to enjoy this piece of wilderness. That was a great read, thanks Ben.